Merry Christmas to my loyal group of readers. I hope you know how much I appreciate you for taking time to read and comment on my little posts. Wonder Spouse and I spent a quiet day at home. But, of course, we couldn’t resist taking a closer look at our still-very-mucky floodplain. Wonder Spouse brought his shovel and rake to pull apart a few blockages in the creek in the hopes that the water level might drop a bit faster. I, of course, brought my camera to document our findings. 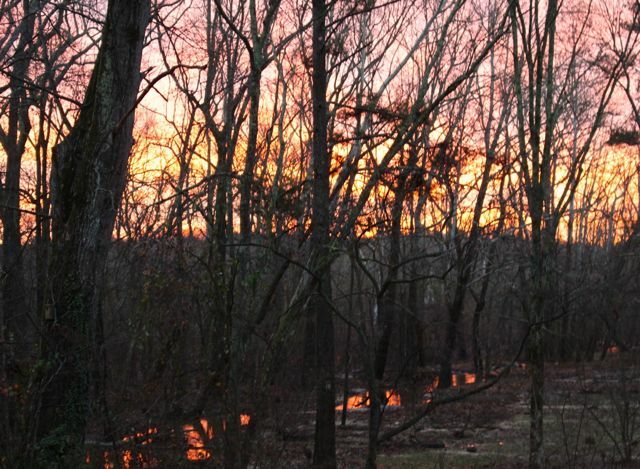 I offer here a sampling of what it looks like on our floodplain, now that the creek has fully returned to its channel. Click on any image to see a larger version and any captions I may have added. Sand/silt deposits left behind as waters receded. Note the pile of debris lodged against the holly. 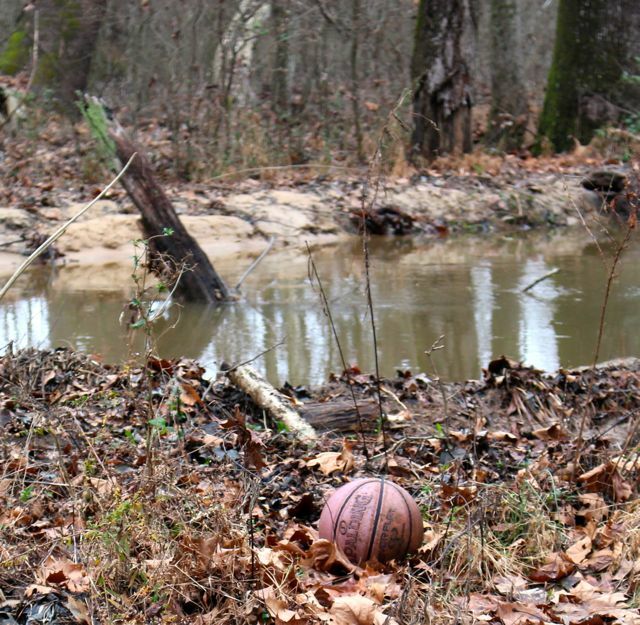 Note the snail on the ball that the creek deposited. We saw a hint of sun just at sunrise. The colors were lovely, so I stepped out onto the deck to take a few photos. After only a couple of shots, it began to rain just enough to force me back inside. The colorful sunrise vanished behind thick gray clouds that never parted the rest of the day. But the Christmas sunrise was photo-worthy. Most of the flowers blooming today were not that far ahead of their usual winter-blooming schedules, but one shrub did surprise me. Apologies for less-than-optimal shots. The gray clouds offered inadequate illumination. Now blooming robustly, my pink-flowering Prunus mume perfumes my front yard with its soft, sweet scent. The tree was covered in happy honey bees from my neighbor’s hives. Jasminum nudiflorum is opening a few weeks earlier than usual. Witch hazel ‘Amethyst’ is just beginning to open, again, a bit early. The hedgerow of forsythia near my road is popping yellow flowers all over. This normally doesn’t bloom until late February or early March. Perhaps it was the cloudy day and the desolate, muck-covered landscape that made me notice rich textures everywhere I wandered. Here a just a few that drew my eye today. A flock of about 30 Cedar Waxwings has been foraging in my yard and adjacent woodlands for about a week now. All the berry-covered deciduous hollies that adorned my floodplain and other areas are now denuded. No berry was left un-devoured. 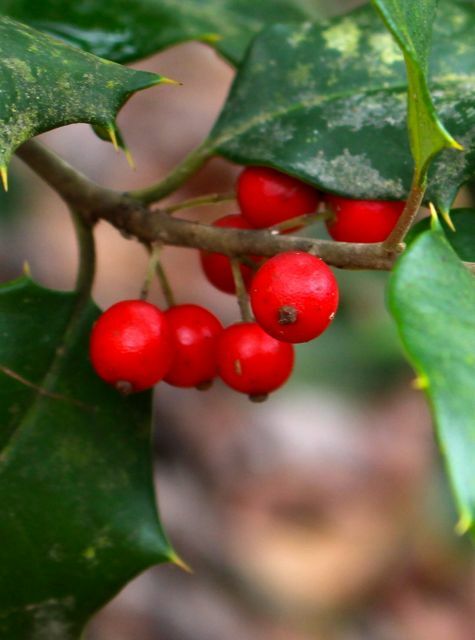 The native evergreen Ilex opaca trees still retain most of their berries. Either they don’t taste as good, or perhaps the prickly leaves make that species a food of last resort. Whatever the reason, they make a nice closing shot for this Christmas walkabout of my muddy corner of southeastern piedmont. This entry was posted on December 25, 2015, 8:50 pm and is filed under piedmont gardening. You can follow any responses to this entry through RSS 2.0. You can skip to the end and leave a response. Pinging is currently not allowed. Thanks, Carol. It’s great to hear from you!